The past reaches out at the most unlikely times. My brother Fergus, a Minister of State in the Irish government, was recently researching the history of the Fleadh Cheoil, (pronounced Flah Keoil) the annual massive traditional music festival held in different towns throughout Ireland with a view to attracting it to Drogheda, the town he represents. 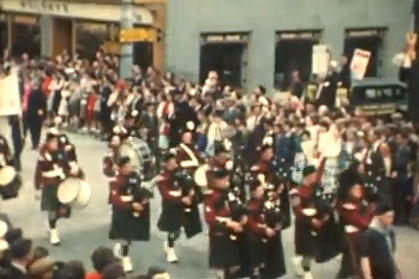 He came across this footage from 1959 of the Fleadh Cheoil festival in Thurles, County Tipperary, the town I grew up in. It contains fleeting footage of my father who was one of the organizers and offers an amazing glimpse into the life and times I grew up in. I was six at the time. As the video opens it is the Whit weekend May 17, 1959 and the Fleadh Cheoil is clearly the biggest thing to hit Thurles, Tipperary in decades. The big march is taking place through Liberty Square in the center of town. The men are still wearing caps, there is an occasional horse and cart, and the locals are done up in their best finery for the special occasion. The parade of local dignitaries is under way, heavy on the Catholic Church monsignors and one glimpse of a purple cassock, the Archbishop perhaps. The local and national businesses, including, a garish P. J. Carroll’s cigarette float, Dwans soft drinks, Bulmer’s Cider (still around) and Phoenix Beer are all represented. There is a blacksmith’s forge on the back of a truck, the fire belching out of it as it parades along. The kids must have loved that. Once a glimpse and gone forever. Later there are couples chastely dancing a reel as the musicians play (there is no sound) and then a hurling game, with a presentation to the winners.There are children marching, my family speculate we may be among them, but we will never know. Then there is a main stage with the priest making a speech, followed by a local dignitary. The camera pans and catches my father, 53 years old, hair slicked back with hair oil in the contemporary style, seated on the podium. The video cuts to a medal presentation and then fades to black. Fifty three years ago, in a small provincial town in Ireland, the air of excitement is palpable, the local pride bursting at the seams. I sit in a New York office thousands of miles away and ponder the imponderable past. Oh to be able to step into that video, walk up to the man on the stage and introduce myself again. So much to say, but alas, will never be said in this life anyway. But a peek at the past has made it possible to imagine.